Water, food, and energy are fundamentally inter-connected. Before I began learning more about this water, food, and energy nexus leading up to the World Water Forum, I didn’t understand the full implications of this. Water is necessary for providing food and energy to populations in modern societies. Water is used to grow vegetables and grains that we consume and to feed animals that we consume. Water is used to cool power plants that produce our electricity and to process the gasoline used in our vehicles. Have you considered how much virtual water you “consume” through the food you eat and the electricity you use? The impacts also occur in other directions: access to energy allows easier transportation of food to those in need and the ability to utilize effective water-purification technologies. In a world increasingly concerned about water, food and energy security, it is important to understand the connections between them all. A threat to any one of them would impact the other two. While much of the World Water Forum focused on those lacking access to water and sanitation, there are 1.3 billion people lacking access to electricity and 1 billion people undernourished worldwide. Because water, food, and energy issues affect and are affected by one another so much, it is important to consider than together rather than in isolation. The High Level Panel: Water, Food, and Energy Nexus on Friday, March 16 discussed these interactions and proposed solutions. The speakers at the high level panel included individuals from a range of countries and backgrounds: Uschi Eid (UN Secretary General’s Advisory Board on Water, Gérard Wolf (Electricité de France), Rodney Cooke (International Fund for Agricultural Development), Dilip Kulkarni (JAIN Irrigation Systems, India), Yasar Yakis (Turkish Parliament), Diego Bravo (Columbia), Jane Madgwick (Wetlands International), Thomas Chiramba (United Nations Environment Programme), Rhoda Tumusiime (African Union), Alain Vidal (Consultative Group on International Agricultural Research, Challenge Program on Water and Food), and Lee Yangho (Ministry of Food, Agriculture, Forestry and Fisheries, Korea). What is the Key to ensuring that we can continue to have access to water, food, and energy in the future? 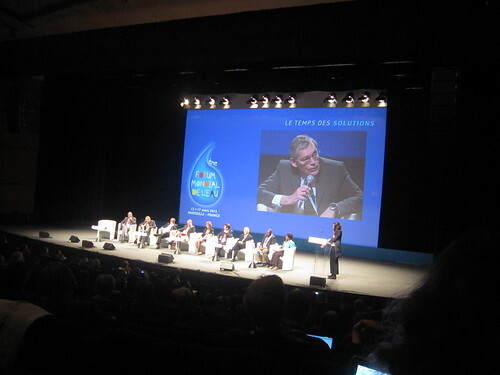 During the high level panel, a question from the audience brought up the suggestion that ecosystems should be a fourth component of the water, food, and energy nexus. Ecosystems fundamentally provide us with the water, food, and energy that we depend on. Unhealthy ecosystems (caused by pollution, overconsumption, habitat loss, etc.) are the cause of many problems impacting the nexus. Thus, improving ecosystems is a strategy used to resolve problems. Several of the panelists, however, responded that ecosystems are already at the center of the nexus. Thomas Chiramba (UNEP) explained the importance of ensuring that ecosystems are functioning properly through the combined efforts of water managers, ministries, and laws. Jane Madgwick (Wetlands International) spoke about the importance of wetland ecosystems. Alain Vidal (Consultative Group on International Agricultural Research) explained how the benefits from ecosystems must be shared among different sectors to avoid success in one sector but failure in others. Several speakers explained the need for increasing resource productivity, improving efficiency, and reducing waste to produce more with less. 1. Altering consumer behavior. Managing consumer demand, particularly in the energy sector, is extremely important to reducing stresses on water supply and other natural resources. An increasing global population, even with a healthy ecosystem, will never have sufficient access to water, food, and energy with current consumption patterns. Demand must be decreased, and efficiency increased. 2. Improving communication. This must be done in a variety of ways. Politicians must be informed of long-term implications of current policies and actions. Different sectors and levels of government must communicate to find solutions that integrate food, water and energy. Scientists must properly communicate with the public and decision-makers. Finally, countries should learn from the mistakes of others. Improving communication will encourage making decisions based on appropriate data, promote progress in one sector or region while not harming progress in another, and support collaboration to find the most effective solutions. Because the water, food, and energy nexus involves so many complex interactions, it can be difficult to approach. These are only some of the many ideas that exist. What do you think is the key to the nexus? Post your ideas below. Rio +20 is coming soon, and with it, a great team of student reporters from around the world. Behind all the student reporters, there are outstanding team leaders (like Caroline D´Angelo) who edit their posts and interviews while guiding them through the hectic journey of live conference-blogging. The Nile Basin Discourse (NBD) is a civil society network with a membership of more than 750 organizations from 11 countries within the Nile Basin Region. It provides knowledge and builds capacity to strengthen the voice of civil society organizations within the Nile Basin Region. The delegation from the University of Pennsylvania (Penn) had 27 students from the Master of Environmental Studies (M.E.S.) and Master of Science in Applied Geoscience programs in attendance at the World Water Forum. At the end of the week, some of us from Penn were invited to present solutions emerging from our institution. On Friday morning, three classmates and I highlighted a few water-related sustainability initiatives currently in place at Penn. Roll On, Nile, Roll On! The Nile is the world's longest river. It is shared between Egypt, Ethiopia, Sudan, South Sudan, Rwanda, Burundi, Kenya, Tanzania, Uganda and the Democratic Republic of Congo (See map below). This opportunity is only for students of Schweizerische Alpine Mittelschule Davos. Spend a week immersed in journalism by getting an insider’s view of how a global media organisation works at the World Economic Forum. Imagining a World Designed in Davos This January, Pro Journo is looking for a team of young reporters from a variety of disciplines to travel to Davos, Switzerland as part of a week-long reporting workshop at the World Economic Forum 2017, led by a deputy editor from The Economist Intelligence Unit and a correspondent from ABC News (America)’s Moscow bureau. Every year, the World Economic Forum gathers the world’s most influential figures from business, government and social organizations in a tiny Swiss town in the Alps to discuss the biggest issues facing the world. This article was published for The Economist Group. We have published an excerpt here.